The highest mountain range on Earth, the Himalayas form the northern border of the Indian subcontinent in Asia. The mountains extend in a massive arc for about 1,550 miles (2,500 kilometers) from west to east with more than 30 peaks rising to heights greater than 24,000 feet (7,300 meters) above sea level. These include Mount Everest, the world's highest peak at 29,035 feet (8,850 meters), Kanchenjunga at 28,208 feet (8,598 meters), Makalu at 27,766 feet (8,463 meters), and Dhaulagiri at 26,810 feet (8,172 meters). Several Indian states and the kingdoms of Nepal and Bhutan lie along the southern slopes of the Himalayas, and the Tibetan Highlands border them in the north. The width of the mountain system varies from 125 to 250 miles (200 to 400 kilometers) from south to north, and the average height is 20,000 feet (6,100 meters). 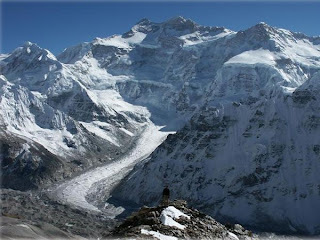 The Himalayas extend over about 229,500 square miles (594,400 square kilometers). India, Nepal, and Bhutan have sovereignty over most of them; Pakistan and China also occupy parts. The Sanskrit name Himalayas, meaning “abode of snow,” truly characterizes the vast permanent snowfields above the snow line. These mountains pose the greatest challenge in the world to mountaineers. Geologically the Himalayas are relatively young folded mountains and are still undergoing the mountain-building process. Precambrian metamorphic rocks—rocks formed by heat and pressure from 4.6 billion to 570 million years ago—make up much of the structure. The uplift took place in at least three phases. The first phase occurred at the close of the Eocene epoch (about 38 million years ago) when the Great and Tethys Himalayas were uplifted. In the second phase, which occurred in the Miocene epoch (26 million to 7 million years ago), ranges of the Lesser Himalayas were formed. The final mountain-building phase started at the end of the Tertiary period (about 7 million years ago) when the Siwalik Range, the foothills of the Outer Himalayas, were formed. The Himalayas act as a great divide and influence the climatic conditions of the Indian subcontinent to the south and of the Central Asian highland to the north. The winter season lasts from October to February, the summer from March to June, and the rainy season from June to September. Climate varies considerably with altitude; the snow line generally lies at about 16,000 feet (4,900 meters) in the Great Himalayas. The annual and daily temperature variation is much greater in the foothills. The mountain ranges obstruct the cold, dry air from the north into India in winter. They also force the monsoonal winds to give up moisture, causing heavy rain and snow on the Indian side but arid conditions in Tibet. Rainfall decreases from east to west—120 to 60 inches (300 to 150 centimeters). Cherrapunji in Meghalaya State in northeastern India is noted for the world's second highest average annual rainfall of 450 inches (1,140 centimeters). The Himalayas are drained by 19 major rivers, of which the Indus and the Brahmaputra are the largest. The Jhelum, Chenab, Ravi, Beas, and Sutlej belong to the Indus system; the Yamuna, Ramganga, Kali, Gandak, and Kosi are part of the Ganges system; and the Tista, Raidak, and Manas belong to the Brahmaputra system. Rivers are more numerous and extensive on the southern slopes of the Himalayas and have great potential for producing hydroelectric power. The Bhakra Nangal multipurpose river-valley project, located on the Sutlej River, is one of the most extensive in India. Such major rivers as the Indus, Sutlej, and Brahmaputra have narrow and deep upper valleys that are older than the mountains themselves. Glaciers cover more than 12,700 square miles (32,900 square kilometers). 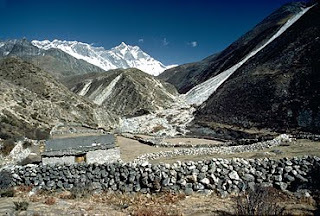 One of the largest is Gangotri glacier in northern India—20 miles (32 kilometers) long. Glaciers feed most of the upper courses of the rivers, while the middle and lower courses are fed by rain. There are several freshwater lakes as well. There is great variation in the Himalayan soils. The dark brown soils are well suited for growing fruit trees. The wet, deep, upland soils with high humus content—especially in the Darjeeling and Assam hills—are good for growing tea. Himalayan vegetation is based on altitude and rainfall and can be classified into four groups: tropical evergreen forests of rose chestnut, bamboo, alder, pine, laurel, and palm up to about 3,940 feet (1,200 meters); subtropical deciduous forest with sal, oak, and magnolia up to 7,220 feet (2,200 meters); temperate forests of cedar, birch, hazel, maple, and spruce from 7,220 to 8,860 feet (2,200 to 2,700 meters); and the alpine zone with juniper, rhododendron, mosses, lichens, and several kinds of flowering plants from 8,860 to 11,800 feet (2,700 to 3,600 meters). Alpine meadows are found up to 16,400 feet (5,000 meters). 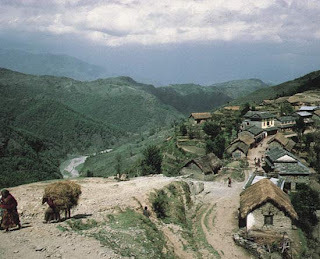 Elephants, bison, and rhinoceroses inhabit the forested lower slopes of the Outer Himalayas. Snow leopards, brown bears, red pandas, and Tibetan yaks are found above the tree line—above 10,000 feet (3,050 meters). Black bears, langur monkeys, clouded leopards, and goat antelopes live in the foothills. Several animal species, such as the Indian rhinoceros, musk deer, and Kashmir stag, or hangul, were at the point of extinction but are now protected in several national parks and sanctuaries in India. There are catfish in most Himalayan streams, and butterflies are extremely varied and beautiful. The people who inhabit the Great and the Tethys Himalayas are primarily of Tibeto-Burman descent, while the Lesser Himalayas are populated by people who trace their roots to Indo-European ancestors. The Gaddis are a hill people who herd sheep and goats. During winter they descend to the lowlands in search of food for their herds, but in summer they return to the higher pastures. The Gujars are also a migrating pastoral people. The major ethnic groups of Nepal are the Newars, Tamangs, Gurangs, Sherpas, and Gurkhas. The Sherpas, who live to the south of Mount Everest, are famous mountaineers. Major Himalayan summer resorts are at Almora, Darjeeling, Mussoorie, Naini Tal, Simla, and Srinagar in India and Murree in Pakistan. Economic resources abound in the Himalayas, including rich arable land, extensive grasslands and forests, workable mineral deposits, and tremendous potential for easily harnessed hydroelectric power. Terraced cultivation is carried on as high as 8,200 feet (2,500 meters). Rice, corn, wheat, millet, jute, sugarcane, and oilseeds are the major crops. Most of the fruit orchards—producing apples, peaches, pears, and cherries—are in the Kashmir and the Kulu valleys. Rich vineyards on the shores of Dal Lake in Kashmir produce grapes of good quality. Saffron, walnuts, and almonds are also grown in the Vale of Kashmir. Tea gardens abound in the foothills of the Darjeeling district. There are also plantations of cardamom and medicinal herbs. Sheep, goats, and yaks are raised on the rough grazing lands. Mineral deposits include coal, bauxite, mica, gypsum, sapphires, petroleum, natural gas, chromite, copper, iron ore, borax, sulfur, graphite, lead, and zinc. Some alluvial gold is found in the Indus Valley. Poor transportation facilities in the Himalayas have acted as a barrier to economic growth. Only in the late 20th century were highways constructed to make the Himalayan region accessible from both north and south. Kathmandu, the capital of Nepal, has an international airport. Srinagar, the summer capital of the Indian-controlled part of Kashmir, has a domestic airport. There are only two narrow-gauge railroads from the northern plains of India into the Lesser Himalayas—one from Kalka to Simla and the other from Siliguri to Darjeeling. 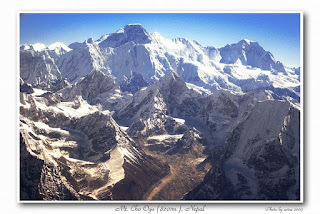 The Himalayas were mapped for the first time in 1590 by a Spanish missionary to the court of the Mughal emperor Akbar. The heights of the Himalayan peaks were first measured correctly in the middle of the 19th century. It was not realized until 1856 that Mount Everest is higher than any other peak in the world. Modern maps of the Himalayas have been prepared by Indian and German geographers and cartographers.